Isuzu teams up with Service Bodies Australia and Palfinger to create a quick-to-build lightweight urban workhorse – and all on a car licence. It’s the perfect truck for those who’ve outgrown a ute but don’t want a big truck. 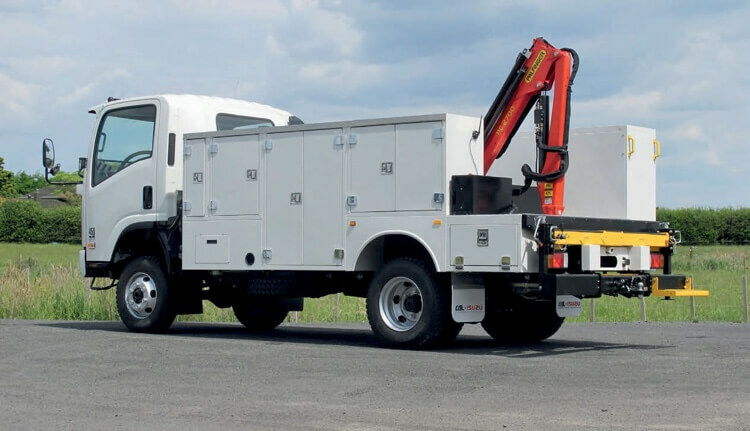 When a one-tonne ute isn’t enough, but a three-tonne one is overkill, that’s the appeal of this Isuzu NLR 250S service truck – fitted with a Service Bodies Australia CityPro body. The ultimate car-sized metro runabout, the Isuzu/SBA combination is an exclusive partnership between Isuzu Australia and Service Bodies Australia (and Palfinger for the crane option), with both Kiwi and Aussie companies working together to make a highly practical and compact workhorse based around the N Series of Isuzu light trucks. Imported into NZ and fitted by two companies – Hamilton’s CAL Isuzu for the North Island, and Smallbone Isuzu in Ashburton and Timaru for the South Island – there are two main models of truck body, the CityPro and UrbanPro, that offer 6-7 size derivatives and a range of payloads from 1800-2500kg for car licence holders, with up to 4000kg for heavy duty service, for both car and truck licences. “There are six basic models across the range,” says CAL Isuzu’s Andrew Farrell, at the large Isuzu truck dealership in Te Rapa Park, Hamilton. Having just finished its first unit, this NLR 250S fitted with the CityPro body, the ease of which the units come together is a key aspect of their appeal. “The units come in fully fitted and ready to be put onto a chassis cab,” explains Andrew. “Fitment takes around three to four hours, depending on the level of accessories. “This is the smallest in the range, on the NLR narrow cab, short wheelbase.” Still wide enough to comfortably fit three across the cab, inside is a range of factory Isuzu equipment. Features include remote central locking, adjustable suspension on the driver’s seat base, adjustable steering, good all-around view, and a Bluetooth enabled sound system that’s smarter than it first looks. Offering both USB and 3.5mm input, it’s able to operate satnav through an optional GPS SD card; the system also features an optional Isuzu reversing camera and audio unit, which is integrated into the body through a profile cut hole, and runs up to four camera/audio units that can be manually selected anytime individually, or as a combination for two, three or four split-screen displays. There’s also a beacon button on the right side of the dash, which operates the optional accessory roof light. The clue that this cab is a little bit special is a DIN-sized panel to the left of the audio system that contains a solitary rocker switch for the Internal Body Light, positioned to allow for easy access from either the left or right side of the parked vehicle. The simple switch activates a number of LEDs that are cleverly incorporated throughout the storage areas. This also offers another clue about the integration of the body onto the chassis, with the plug-and-play system enabled effectively by three small harnesses that integrate into the Isuzu loom for the switch, LEDs and central locking, that unlocks not just the cab doors, but every one of the 12 cabinet doors. It’s also a smart system too, as if any of those doors are ajar, the central locking will not activate, signalling a safety or security risk. With the doors unlocked, the body reveals eight main storage areas, starting with the tall, narrow through-box, which is accessible Twelve doors and seven key compartments are available in the standard (craneless) body, with a range of shelving height options. A double-locking double gate adds safety and security to the bed storage. Anchor points are each rated to one-tonne. from either side, and is ideal for long tools, shovels for example, or cylindrical objects that could roll around. The doors themselves are double-skinned, thick and sturdy, with slam-shut paddle handle locks that feature two-stage rotary latching: a quick flick for closing, or a harder shut for locking, though either stage is steadfastly secure. Inside each door is a number of pockets for aerosol cans and smalls, with three shelves on each of the mid doors and four shelves on the taller rearmost lockers. Each door also has a damper, adding another level of quality and operation. With the CityPro replicating the powder coated body in a mirror image cabinet design on both sides, the leading door on each side is the sealing door, and each of the shelves can be tailored through a range of nine heights in the mid bins, or 14 heights in the rearmost lockers – or removed completely, for example in the rear cabinets, to take an oxy-acetylene kit, with the provision for venting. Kurt Brown tops Isuzu Truck Technicians Guild Examination – again! © Copyright CAL Isuzu 2019 All Rights Reserved.